We're here to propose you an adventure map we made, me and my friend, in around 15 months. The map is called "MLGdrop", because the principle is to fall on different levels, pass through obstacles, and land on the floor by placing water under you, just before you die! This map combines Dropper (inspired by Bigre's The Dropper) and a MLG water bucket! The map has 30 levels, all different from each other (to compare, The Dropper has 19 levels! ), from 30 blocks to 250, and they are all well-built. Some MLGs are different and don't simply need a water bucket, sometimes you need to MLG on a horse, sometimes with a web, sometimes you need to grab your bucket in Mid-air... But we let you discover! MLGdrop has 3 levels of jumps too, from the easy one to the hard one! Furthermore, this map is playable in English, AND translated in French! 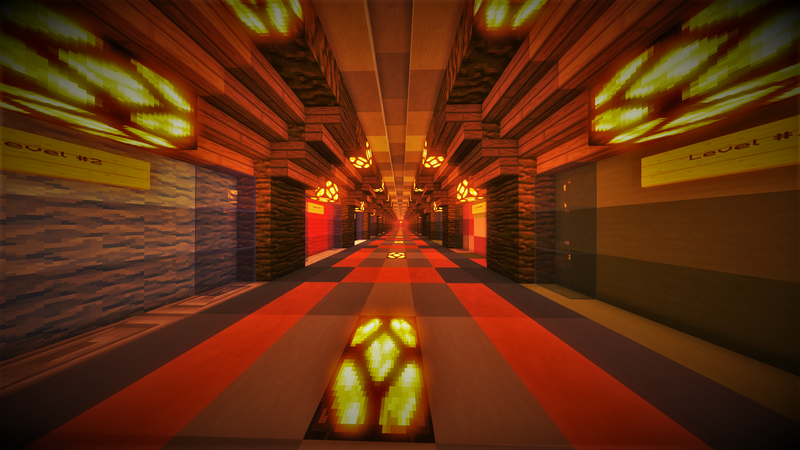 To conclude, this map took us a long time to imagine, build, and enable and is very complete :) Play, and share your opinions! I dont get through level 3. Anyone has a tip for me? Hi, it is normal if you cannot MLG on the floor, some of the levels of the map like this one has some puzzle aspects. To succeed the level 3 you simply need to land on the right island (use the hint bro). Then just pick an item on a hidden chest of the island which will help you to finish the level 3. +1 runasas I dont get through level 3. Anyone has a tip for me? I don't get how to get through the level 5, I die every time, you only end up with half of a heart and you die almost instantly. What are the vines for? You can't place it in any site, I tried to play on 1.9 and 1.10 and 1.9.2, it's in all versions the same problem. And even with creative I don't know where are the next level buttons. Help please! Hey, don't worry the level 5 is totally possible to complete. The you can place the vines on the groups of trunks on the ground, around the big tree, it may takes a bit of practice, the strategy is too fall along the "trunks" and spam the vines just before you hit the ground. The next level buttons are on the ground too, just follow the hedge of the level and you're gonna find them (a bit in the ground). Hope that helped you, if you have any more problems ask us! One stupid ask... but what is MLG stand for? Actually it's not that stupid to ask, MLG therm is a bit blur to be honest, but in Minecraft it just means to make a stylish action. -1 KIKONUTINO I don't get how to get through the level 5, I die every time, you only end up with half of a heart and you die almost instantly. What are the vines for? You can't place it in any site, I tried to play on 1.9 and 1.10 and 1.9.2, it's in all versions the same problem. And even with creative I don't know where are the next level buttons. Help please! +2 Theo92160_ Hey guys, we found a small problem we didn't notice before, You can't acces the level 19 because of a small mistake from my mate, to fix it just access behind the pannel of the level, where the command blocks are. You will find the /tp which causes the problem under the last command block (which is a /spawnpoint), replace the command by /tp @a[r=6] 39 113 104 and put the command block in UN-CONDITIONNAL mode. after that it should fix it! +1 Theo92160_ And of course guys, if you have any feedback, criticism, questions, feel free to ask us! -1 FH One stupid ask... but what is MLG stand for?